Her presence amid the high rents of Fifth Avenue may have surprised some, but then, Ms. Hardeman, 42, possesses what amounts to a Do Not Harass card. 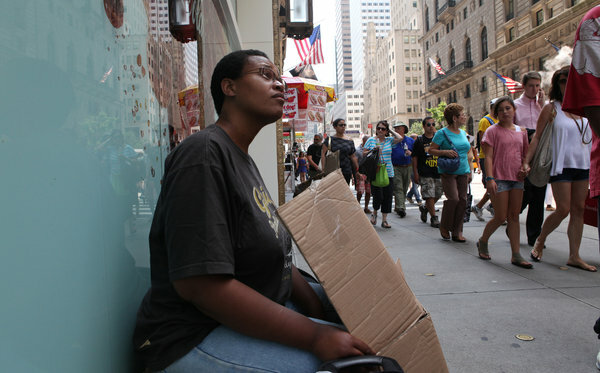 After leaving a job last August and becoming homeless in September, Ms. Hardeman began panhandling on Fifth Avenue. One afternoon in March, she said, police officers arrested her there and detained her in a precinct station house before releasing her without charges. The arrest led to a lawsuit, filed in May in Federal District Court in Manhattan. The lawsuit has not been resolved, but she has already taken a small measure of victory. On Aug. 12, a federal judge in Manhattan approved a stipulation between the City of New York and Ms. Hardeman: the city agreed not to arrest or issue a summons to her, unless there was probable cause that she had broken the law. In addition, the city agreed that it would instruct officers in the Midtown North Precinct on the definition of the disorderly conduct statute by Sept. 15. The stipulation came after Ms. Hardeman complained to the judge that she had been harassed several times by police officers after she filed the lawsuit. Although it is a matter of standard law that no person should be arrested without probable cause, the fact that Ms. Hardeman managed to secure a judge-approved stipulation was something of a feat. Ms. Hardeman referred to her style of solicitation as “passive panhandling,” involving little more than sitting quietly and letting her cardboard sign do the talking for her. “I never broke the law,” she said, describing her time on Fifth Avenue. The lawsuit stemmed from an encounter in late March. Ms. Hardeman said two officers asked her for identification. She told them she had none, and the officers arrested her. She was taken to the Midtown North Precinct station house, where she remained for about five hours until the police released her without filing charges, she said. Two months later, Ms. Hardeman filed a lawsuit asserting that the arresting officers had violated her 4th and 14th Amendment rights. Two days later, court papers said, a police sergeant called her on her cellphone asking to discuss the case. Ms. Hardeman said she referred the sergeant to her lawyer. Each time, Ms. Hardeman said, she refused to leave. On one occasion, officers handed her a disorderly conduct summons, saying she was blocking pedestrians. On another occasion, she said, officers briefly handcuffed her and placed her in the back of a police car before issuing another disorderly conduct summons. Ms. Hardeman denied that she had blocked pedestrians, saying that the recessed area she sits in is 20 inches deep and that she takes up only 10 inches of a 16-foot-wide sidewalk. Sam J. Miller, the lead organizer with an advocacy group, Picture the Homeless, said he had heard many complaints from homeless people, accusing the police of arbitrarily issuing them disorderly conduct summonses. “We have found hundreds of incidents of the police using disorderly conduct wrongly against homeless folks,” Mr. Miller said, adding that many of those charges were later dismissed or could not be substantiated. Ms. Hardeman said she had been homeless off again on again for about 20 years. She said she quit a job as an assistant at a law firm last August, hoping to find something more fulfilling. A month later, she said, she lost a rented room in the South Bronx. For a while, she worked in Times Square, selling tickets to a comedy club. Then, in March, her resources and stamina depleted, she arrived on Fifth Avenue with a plastic milk crate and her sign. On a good day there, she said, she can collect enough for necessities: a MetroCard, a rented storage space, the phone bill and some food. Ms. Hardeman said she did not relish the disagreements with the police. But, she added, after losing her home in the Bronx, she was unwilling to walk away from her post on Fifth Avenue.